This visual abstract depicts what Lee et al. 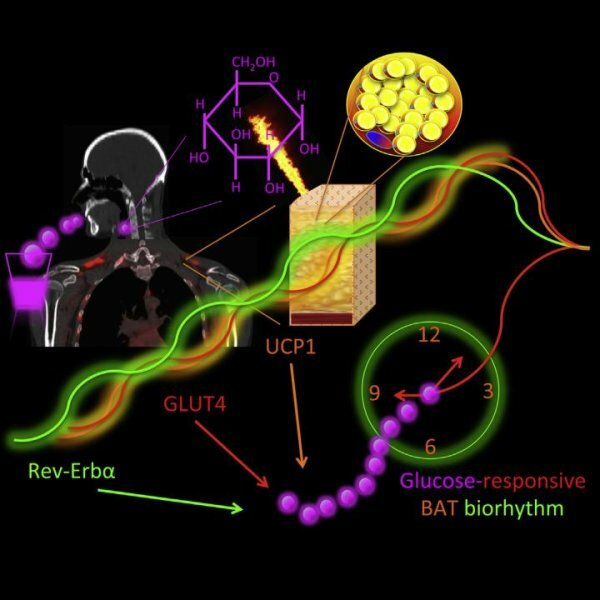 found, how glucose utilization by brown fat in humans is coupled with heat production in a circadian manner. Higher brown fat abundance correlates with lesser glycemia variability, suggesting that brown fat may help buffer glucose fluctuations and maintain whole-body glucose homeostasis over time. Brown fat is well known for protecting the body from cold temperatures, and now researchers have discovered that this cell type in humans shows circadian rhythms in its consumption of glucose–an energy fuel for heat production. These rhythms, which rise just before waking, may have evolved as a thermal defense mechanism to prepare our ancestors for hunting and gathering in the coldest morning hours. The research appears March 10 in Cell Metabolism. In the survival hierarchy, the maintenance of the body’s core temperature trumps the need for food and water. In response to cold temperatures, brown fat consumes a large quantity of glucose and lipids as a fuel source for generating heat and keeping the body warm. By the same token, cold-induced activation of brown fat burns calories and lowers glucose levels, thereby protecting animals against obesity and diabetes. But it has not been clear whether brown fat regulates glucose levels in the absence of cold exposure. While investigating this question, Lee and his team discovered that human brown fat cells show circadian fluctuations in glucose consumption. In brown fat tissue samples from surgical patients, genes involved in glucose uptake showed rhythmic fluctuations in their activity levels, with rises occurring during the pre-waking period. The findings provide new insight into the role of brown fat in regulating metabolic activity, above and beyond its chief role in heat production. The researchers also discovered, in a sample of 15 healthy that individuals with a high abundance of brown fat showed less variability in their glucose levels over a 12-hour period than did individuals with relatively little brown fat. A major hallmark of diabetes is large fluctuations in glucose levels, which increase the risk of complications such as visual impairments, cardiovascular disease, kidney disease, and neurological problems.